Fortunately, this will not be Burger Queen's epitaph, since she has not died but only moved to Houston. (In some of our minds, the two are synonymous.) She found her Burger King, and we all wish them well and hope they have many Sliders. We knew our last burger trip with Burger Queen would have to be special. 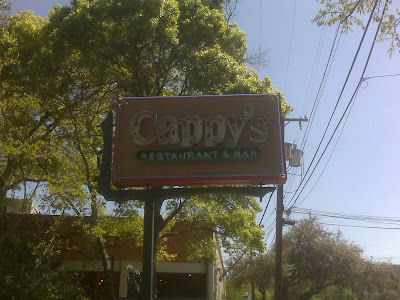 Sensing that a dive like Belle's wouldn't do for this last lunch, we decided to go upscale and headed for Cappy's, a popular Alamo Heights establishment located on Broadway just north of Central Market. (In doing this, we made an exception to our usual rule of only dining at burger joints, which are not to be confused with restaurants that also have burgers.) Cappy's was established in 1977, and many of its dining faithful have been going there since they and the restaurant were much younger. Upon arriving, I waved to my good friends Judith and Ethel, who were seated comfortably indoors, enjoying the chef's special. 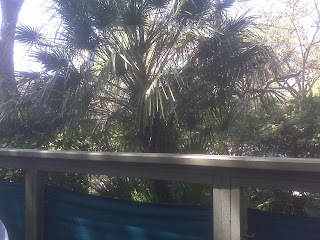 Since it was a nice day, we decided to eat outside on the patio. Our server, not recognizing us for the cheapskates that we are, continued to bring us baskets of Cappy's delicious bread as fast as we could devour them. A few of us were tempted to forgo the meal and just fill up on the free bread and water, but in deference to our readers, we all shelled out for burgers. We all had high hopes for the Oak Grilled Kobe Burger, and why not? A gourmet burger prepared by a gourmet chef, crafted from Kobe beef and grilled over an oak wood fire - this burger had a lot going for it. 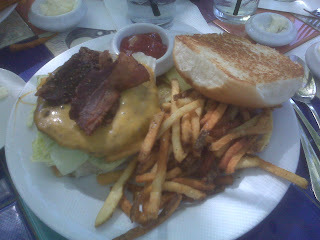 Alas, while good, the burger did not fully live up to our expectations. Hamburglar summed it up best: "This burger has potential, but falls just short. Surprisingly, the bacon that comes on the burger actually took away from the overall flavor. I've had the burger at Cappycino's right next door on several occasions and it is very similar to the burger offered at Cappy's, but for some reason Cappycino's makes a significantly better burger." One thing the Cappy's Kobe Burger does have going for it is the bun, which is soft and sweet (like the bun served on the Cappycino's burger). 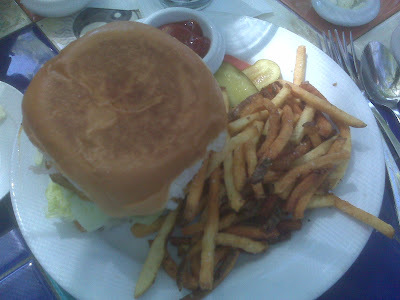 Cappy's also has a Bean Burger, although no one in our party tried this. In all fairness, you could easily bump this rating up a couple of points if you counted Cappy's sweet, honey-flavored bread as a side. But the fries that came with the burger were a bit disappointing. While half of my fries were pretty good, the other half were hard as a rock. Hamburglar and Burger Gal rated the fries a bit higher than me (Hamburglar commenting that they were "well seasoned" and had "a great crispiness"), but Burger Boy agreed that the fries were nothing to write home about. One would expect Cappy's to slay the competition when it comes to service, right? Well, apparently it takes more than immaculately dressed servers to impress Burger Gal in this regard. In her opinion, "Speed was certainly lacking. 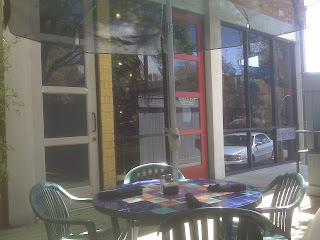 They were flexible to accomodate us all outside at one table, but it was a long lunch." Of course, that's how some diners like it. Judith and Ethel, for example, like to take a short nap between the soupe du jour and their main course. I must admit, the rest of this review may have been subconsciously impacted by the small fact that our burgers each cost 13 freakin' dollars (pre-tax). Add to that a drink (which I thankfully passed on) and a tip for your fancy pants server, and you can easily kiss one Jackson goodbye in the course of a very long lunch.